In the continuous casting (CC) of steels, tundish is a buffer refractory lined vessel which is located between the ladle and the CC mould. The tundish serves the purpose of a reservoir and a distribution vessel. Over the years, there have been dramatic changes in CC tundish. From a mere reservoir and distribution vessel, the tundish today is viewed as a steel refining vessel and a totally new field in the process of steel making technology has emerged which is known as tundish metallurgy. Tundish today also fulfills certain metallurgical functions such as feeding of the liquid steel to the mould at a controlled rate, and thermal and chemical homogenization etc. It also focus on the continuous improvement of many quality related parameters such as fluid dynamics, thermal insulation, inclusion floatation and removal, and hydrogen pickup etc. Different refractories associated with tundish include tundish lining materials (both permanent and working lining), dams and weirs, impact pad, flow control system (monoblock stopper or slide gate), pouring stream protection between tundish and mould (shroud or submerged entry nozzle,SEN), tundish nozzle, and seating block. Dams and weirs are made of magnesite (MgO) boards or alumina (Al2O3) bricks. Liquid steel from tundish to mould is fed by nozzle submerged into molten steel in mould. SEN are to be resistant to corrosion and spalling, Nozzle clogging is also important. Isostatic pressed SEN with alumina graphite-fused silica are commonly used. 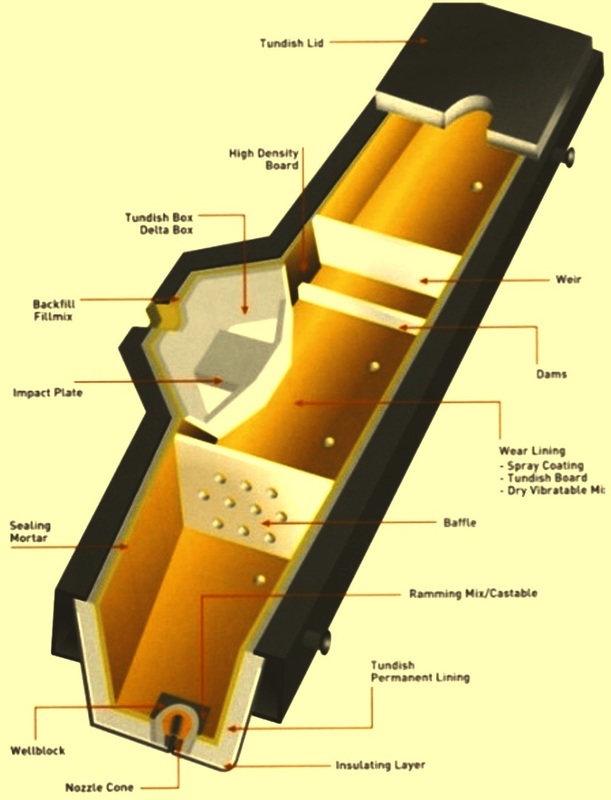 Fig 1 shows typical tundish along with its refractories. The refractory lining design and quality of refractories used for lining have major influence on the operational parameters of CC machines such as super heat requirements, speed of the machine, the phenomenon like initial cold running stopper, nozzle clogging, tundish through etc. Due to the temperature extremes involved, refractory linings of the tundish are to be designed to withstand thermal shock, prevent thermal loss, prevent oxidation, and resist erosion and corrosion while preventing the liquid steel getting contaminated with unwanted impurities. Selection of refractories for a tundish is also critical due to long casting sequence, faster tundish turnaround, higher campaign life, cleanliness of steel, and because tundish refractories constitute high specific costs in CC operation. The tundish lining material has a direct influence on the quality of the liquid steel, since it is close to the solidification stage. Tundish working lining remains in contact with steel and erosion is initiated at the liquid steel-air interface with fluctuation of liquid steel level in the tundish. Different metallic oxides present in the liquid steel are the primary eroding agents for the tundish refractory lining. Slag coming in contact with tundish refractory during casting and the tundish covering powder are also responsible for the erosion. The starting point of erosion is the formation of ‘hair cracks’ at the liquid steel-air interface due to thermal spalling. Penetration of liquid steel and slag takes place through these hair cracks and subsequently erosion occurs. Further, complex interactions at the refractory-liquid steel interface can also impair the steel quality due to the formation of inclusions. Lower erosion of working lining ensures less non-metallic inclusions in the steel. The refractory lining of a tundish has a defined lifetime depending on the qualities of the lining and the types of tundish slag. Chemical reaction between the refractory working lining layer and the tundish slag is very important especially in the case where there is high sequence casting. The refractory working lining in the tundish is subject to different stresses resulting from the thermo-chemical load. The slag chemistry and slag viscosity play an important role in the wear of the refractory lining. In practice tundish slag composition varies widely even in the duration of a single sequence. Hence none of the refractory compositions gives good performance with all the types of the tundish slags normally encountered during operation. It is desired that the tundish refractory lining fulfills a number of different functions which includes resistance against liquid steel (high solidus temperature), resistance against tundish slag, low heat conductivity (good thermal isolation properties), good stability (no erosion of refractory during casting), high resistance to thermal shock, chemical inertness, must be disposable after use, and reasonable in price. Further tundish refractory lining is to have low oxygen potential, good mechanical resistance, low hydrogen pick up by steel, and easy deskulling. There are several tundish refractory lining practices which are in use. These include (i) brick lining, (ii) gunnable lining, (iii) tundish board lining, (iv) sprayable tundish lining, and (v) dry tundish lining. Each practice has its advantages and disadvantages both in terms of operations and impact on steel quality. These tundish lining practices are described below. Brick lining of tundish came into existence along with the introduction of CC technology for casting of liquid steels in 1960s. This is basically an extension of ladle refractory practices to the tundish. In this type of lining, high alumina bricks are normally used. The bricks are in direct contact with liquid steel, after preheating. The advantages of this type of lining are low risk of pickup of hydrogen by liquid steel, low inventory, no investment in specialized lining equipments, and low risk of lining wash out. Disadvantages of brick lining are requirement of intensive curing, long tundish preparation time, high labour intensiveness, poor insulation, high thermal conductivity contributing to higher temperature loss, no possibility of cold start, chances of tundish through because of presence of weak joints, difficult stripping of used lining, and the requirement of large numbers of tundishes. Gunnable linings in tundish was initially introduced by the Japanese steel industry for overcoming the problems of the brick lining. In this method the dry refractory powder of the right composition after fluidization is transferred and installed on the tundish wall by using a gunning machine to obtain a monolithic lining. Initially these were alumino-silicate based and later converted to basic type (magnesite based) to assist with metallurgical practice. Conventional tundish gunning materials are designed to have a low strength between 1000 deg C to 1250 deg C.
This feature assists in formation of a weak zone between the backup lining and the sintered zone, which in turn facilitates easy deskulling. One of the many disadvantages of tundish gunning material is the shrinkage at high temperature which deteriorates the performance of gunning material. A high shrinkage causes high stress and subsequent crack formations during operation whereas a low shrinkage can be a barrier for easy deskulling. This type of lining provides a monolithic joint free structure and relatively improved deskulling operations but little is gained with regards to the preheat times or heat losses because of the high density of the gunned linings. This type of lining has a tendency to crack and to spall during rapid preheating and hence the tundish with the gunnable linings cannot be subjected to cold start practices. The advantages of gunnable lining are low risk of pickup of hydrogen by liquid steel, low inventory, no joints, less labour intensive, relatively easy installation in lesser time, and relatively less difficult to deskull. rebound losses, poor insulation, no possibility of cold start, high risk of wash out, low thermal stability, dust problems, energy intensiveness, high costs, difficulties in applying variable thickness, and investment needed for gunning equipment. Shortly after the introduction of continuous casting it was realized that some type of disposable lining was re­quired to reduce the refractory costs and improve thermal insulation. Bricks and conventional gunning products were unreliable and provided no ther­mal insulation. The introduction of low density, disposable, pre formed and pre cured tundish boards in mid 1970s offered good thermal insulation and low re­fractory consumption. However the tundish board linings have the disadvantage of higher man­power and time required for their preparation. This lining with silica (SiO2) based boards has become popular in the areas where labour costs are low and application technologies are not readily available. The popularity of tundish board lining is also due to its low costs, no need of investment in equipment, and easy to deskull. The use of SiO2 based boards allows only cold start practice. During 1980s magnesite (MgO) based boards were introduced for fulfilling the requirement of pre-heatability for a hot start practice which is needed for low hydrogen considerations in the manufacture of high alloy quality steels. SiO2 based boards are used for mild steel and MgO boards for special steels and for steels with high calcium content. The reason being silica is attacked by lime, alumina and iron oxide present in the steel. The advantages of the tundish board lining includes lesser tundish inventory, low hydrogen pick up in case of boards with hot start, uniform shape of the lining, no need for curing, good insulation, possibility of cold start and hence energy savings, easier deskulling, low requirement of energy, no investment needed in equipments, low risk of wash out, and better working environment. The disadvantages of tundish board lining include presence of joints, sand backing, danger of hydrogen pick up in case of cold start, labour intensive, need of high inventory, problem of handling/breakage, and high cost in case of magnesite based boards. The sprayable tundish lining was first developed in1982 and being used widely since later half of 1980s. Presently it is being used in more than 50 % of tundishes around the world. This type of lining combines successfully many of the advantages of tundish board lining and gunnable lining, while eliminating the disadvantages like – joints, sand backing, rebound losses, dust problems, and poor insulation etc. The quality of lining is dependent on skill of the spray operative and the drying equipment. In sprayable tundish lining a thick slurry of refractory materials is thoroughly mixed and is transported and deposited onto the tundish after atomizing with compressed air. The refractory materials used are mainly MgO and SiO2. The MgO content is usually in the range of 70 % to 90 % with balance percentage of SiO2. For longer duration of sequence casting higher amount of MgO along with higher thickness of the lining is needed. The lining operation can also be carried out with robotic application system. Since homogeneous mixing is done in this lining before the product is applied, the incorporation of special chemical additives is possible which helps to improve thermal stability properties of the lining and impart good flexibility. For chemical bonding in the sprayed mass, preheating at around 1000 deg C is needed. Sprayable tundish lining has significant advantages of lower density of the lining and better control of the lining thickness when compared with the gunnable linings. In this type of lining normally fibres and other chemicals are added to the refractory mass. The lining is preheated in case of hot start tundish, or is allowed to cool to room temperature and taken as a cold start tundish. The lining integrity is to be ensured during curing and this requires deposit of the lining material on the tundish permanent lining after its temperature is lower than 100 deg C. Being a wet processes using up to 30 % water and with the presence of hoses and spill-overs, the process creates occupational health and safety issues. The advantages of sprayable tundish lining includes low risk of hydrogen picking, absence of joints, lower inventory, lesser labour intensiveness, easy to deskull, good insulation properties, possibility of cold start, and controllable lining thickness. Disadvantages of lining include requirement of investment in equipments, need of intensive curing, and moderate risk of wash out. Dry tundish lining was developed at the same time as sprayable tundish lining. However, the high price of phenolic resin powder and associated health and safety issues has resulted into dry tundish linings being used only in a handful of steel plants. Recently resin free binder systems (sodium silicate binder, or glucose binder) have elimi­nated any health and safety issues and in addition the second generation of dry tundish products have been introduced with significantly reduced tundish prepara­tion time. Dry tundish lining process differs from other lining processes since it is applied in a dry powder form and does not require the addition of water. Normally this lining makes use of a resinous bond. The added resin is activated by applying a small amount of heat. The forming of lining is carried out by using a former and feeding the dry powder in the gap between the permanent lining and the former. Special drying arrangement is required for drying this mass at around 300 deg C for 24 hours to develop polymerization of resin which gives strength to it. For the activation of the resin to develop a bond hot air at around 400 deg C is needed. The need of vibration of the dry powder depends upon the product being used. The dry tundish lining has relatively lower insulation because of its higher density. It needs service of the crane of the tundish bay for its installation. In case of dry lining since no water is used, there is no direct adhesion to the permanent tundish lining. This helps in good deskulling and prolongs life of tundish lining. One advantage of dry tundish lining is that it ensures slow hydrogen pick up in the steel as it does not require water for application. Around 0.7- 0.9 ppm hydrogen pick up is reported as compared to 1.8 – 2.4 ppm in sprayable tundish lining. The smooth finish on a dry lining and abil­ity to consistently reproduce lining geometry offers improvements in steel quality and better erosion resistance resulting in the potential to increase sequence lengths. Since this type of product is a free-flowing powder, in­stallation equipment is relatively sim­ple and easy to maintain. Other advantages of dry lining are a monolithic lining, lower inventory, less labour intensive, lower tundish preparation time, lower risk of wash out, easy to deskull since there is no direct adhesion to permanent lining, environment friendly application, possibility of long sequence, and easy and quick installation. Disadvantages of the lining include high investment needed, lower insulation and dependence on shop crane.